San Diego’s Balboa’s Park offers a wide variety of museums. It can be hard to choose which ones to see if you only have a few hours to explore. Consider visiting Museum of Man: Balboa Park’s first museum! The origins of this museum date back to 1911 when San Diego was in the planning stages for its Panama-California Exposition to be held in 1915. The main exhibition was The Story of Man Through the Ages housed in the California Building. This grand Spanish-styled building served as the entry to the exhibition, greeting visitors after they crossed the iconic Cabrillo Bridge. When the exhibition came to an end, San Diegans had the foresight to create an association to retain and preserve the collections. By the 1940’s the focus on archaeology led to a name change: The Museum of Man. As decades passed, the focus narrowed even further to Western civilizations, but allowing temporary exhibits to provide a “cross-cultural perspective”. The following exhibits were on display during my visit to the Museum of Man. (2) Race: Are we so different? Fascinated by the Ancient Mayan Civilization? It’s hard to miss this exhibit when you enter the Museum of Man. Huge casts of original Maya Monuments from Quirigua, a site in Guatemala, are on display in the main room of the museum. Made for the 1915 Exhibition, these casts have preserved the contents of the original monuments which have been damaged due to the passage of time and weather. Delve into beer’s history with this exhibit on the original craft beers. This small, but interesting exhibit focuses on the techniques used by the Ancient Egyptians, Sumerians, Chinese, and others. Discover which region can claim the oldest beer and which civilization used corn to produce beer. Yum? Love myth, legends, scary stories? Find out more about the creatures in these stories from our history in this interactive, kid-friendly exhibit. Anyone else remember when Post Secret began? Over a decade ago Frank Warren, founder of the community art project, began collecting and sharing post cards with anonymous secrets shared on them. Some are shocking while others are humorous, but all are someone’s experience or thoughts that are now shared with the world. In this exhibit you can read through many of the secrets that have been shared in this project and write your own on provided post cards. Do you have a secret to share? Humans have a strange relationship with animals. We invite some into our homes as pets while expelling others as pests, put some to work, hunt or eat others, and both jeopardize their existence and save their lives. How did we get this this complicated stage? Find out in Living with Animals. Just a warning, there is one portion that may not be suitable for children, vegetarians, or animal lovers. In a closed room there is a video about the food industry…that’s all I’ll say. I skipped it. Tucked away under archways near the Maya Exhibit are two graffiti murals painted by artists from Writerz Blok and spray paint artist Chor Boogie. How much do you think you know about cannibalism? Read about where cannibalism has actually been practiced and where it was merely a fabrication to invoke an image of savagery to oppress native peoples. For the best views of Balboa Park, and to learn some of the park’s history, take a tour of the California Tower! From the tower you can see Downtown San Diego, Balboa Park, the Ocean, and even more on a clear day. Be sure to purchase tickets to tour the California Tower when you buy your tickets for the Museum. You’ll meet in the front of the museum and be asked to place belongings in a locker. Arrive at least 15 minutes before your tour begins to sign waivers as well. Did you know that the tower was closed to the public for 80 years? 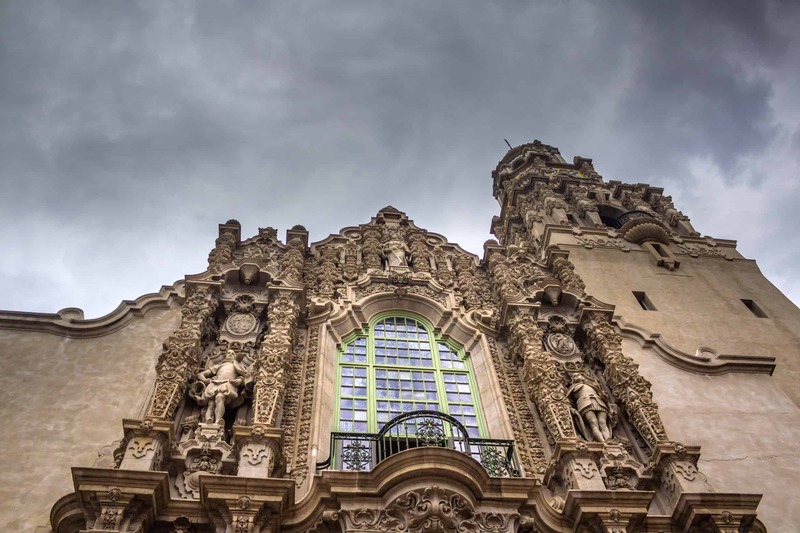 Don’t miss the opportunity to see Balboa Park from above, now that the tower is open. Not only do you get a 360 degree view of the city, you’ll learn a little history about the park. The first floor on the tour displays an organ that plays music throughout the day, sometimes automatically and other times by an organist. You can request a song, too! The second floor provides a view through a slotted window of the Cabrillo Bridge. There is a picture from 1915 on display so you can compare the past view with today’s. The last floor has a spiral staircase leading to the top floor. You’re allowed a few minutes at the top, which is plenty of time for photos and taking in the view from each balcony. I chose Museum of Man for two reasons: (1) The building includes the California Tower, and (2) My friend and guide for the day had yet to visit. The tour of the Tower was more appealing to me than the museum in the end, but it may have just been the exhibits at the time. Don’t get me wrong, the exhibits were interesting, especially the one on Cannibalism, but I suppose I just prefer art museums.